Gaming peripheral maker Razer is not known for its understated designs. Its keyboards in particular are generally bulky and flashy; some might say a little gaudy. The Blackwidow Lite is none of those things. Not that there’s anything wrong with big and flashy—some of my favourite Razer gear is pink, after all. But sometimes a typist just wants something simple to type on. Something that doesn’t look like a rave threw up on their desk. The Blackwidow Lite is that sort of keyboard. 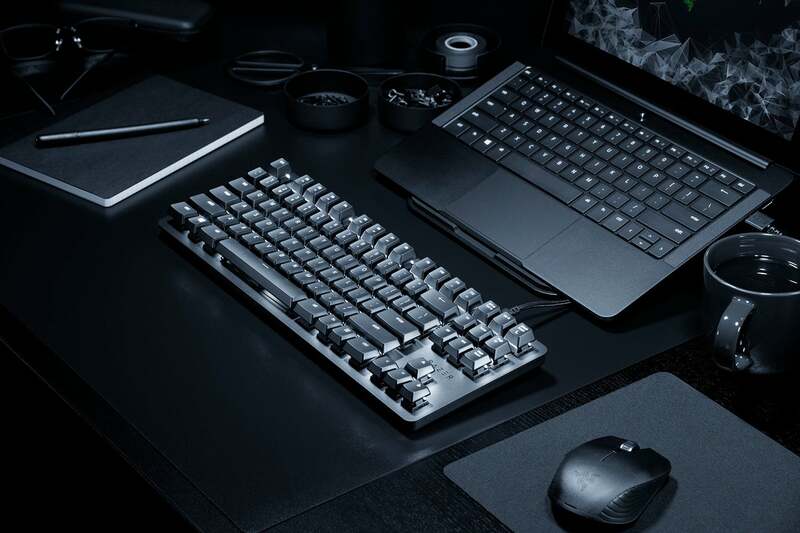 Razer’s lifestyle photos of the Blackwidow Lite suggest this is an excellent keyboard for super villains. It’s a basic tenkeyless board (that’s without the number pad) with a slight profile that’s quite popular in mechanical keyboard circles these days. The bezel around the keys is slight. There is LED lighting but it’s just white, more about visibility than showing off. It’s even got a detachable USB cable, for when you want to...detach your USB cable. 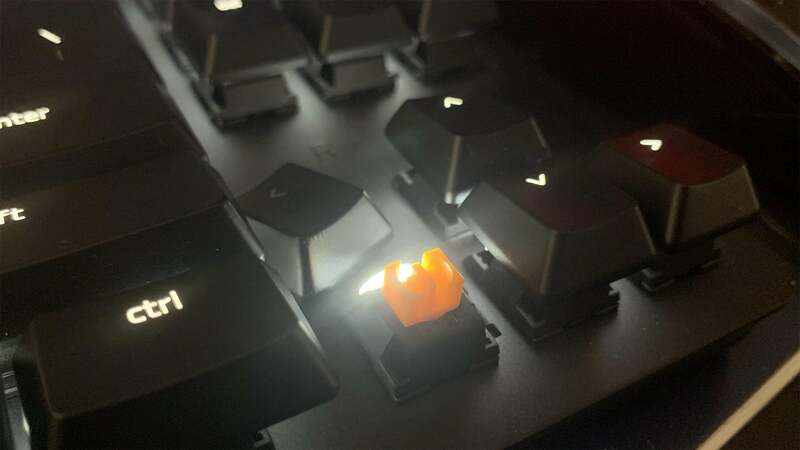 Since this is a keyboard built for typing, Razer has outfitted the Blackwidow Lite with its orange mechanical switches, which feature a tactile bump rather than a click. They aren’t silent, but they’re not as loud as the company’s clicky green or linear yellow switches. And if the orange switches are too loud, the keyboard also comes with a bag of o-rings, rubber donuts that go between the keycaps and the stem of the switches to help dampen the sound. I do not use them, as my family has resigned themselves to their loud, keyboardy fate. For a Razer keyboard, the Blackwidow Lite is an odd duck. It’s small, sleek and efficient. Instead of a garish design crafted to catch the eye at retail, it sports an understated style more akin to enthusiast keyboards. And there’s not a squiggly Razer logo anywhere on it, just the company name above the arrow keys. It’s odd that the company even call this a Blackwidow. 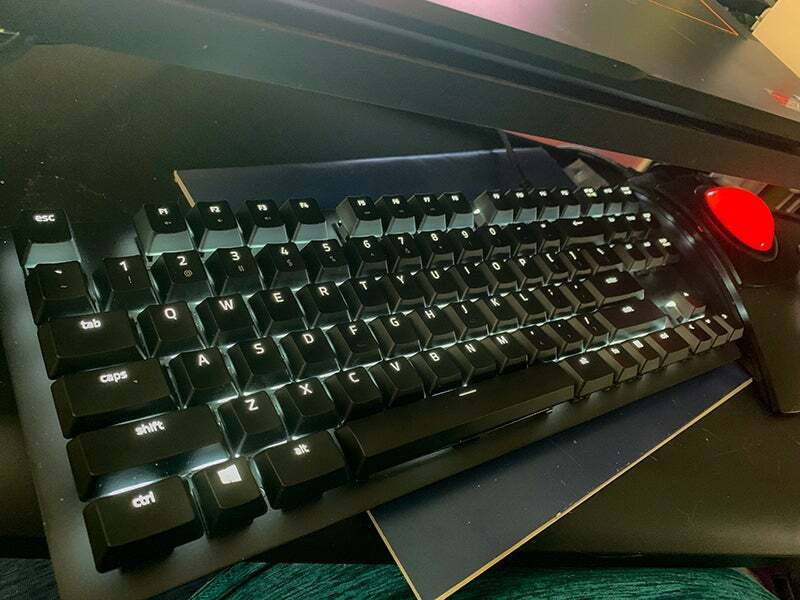 It’s a line that’s always shouted “Gaming Keyboard!” The Lite works well enough for gaming purposes, but it feels more like a workhorse than a playhorse (which is totally a thing). Makes me wish my trackball colour could change. And also makes me wish I had dusted my desk. The Razer Blackwidow Lite is now available at Razer’s online shop for £99.99, which is also a very un-Razer mechanical keyboard price. Hopefully they will release it in pink soon, so I can fully commit.